Dress up facility interiors and exteriors with the sophisticated flared design of this round concrete receptacle. Skillfully crafted, this large round receptacle is constructed with steel reinforced concrete, maximizing the unit's strength and life span. The funnel aluminum lid provides a generous opening for trash disposal and is available in a variety of colors to add an accent the concrete material. Servicing this concrete receptacle is made easy, simply removed the aluminum top to gain access the polyethylene liner. 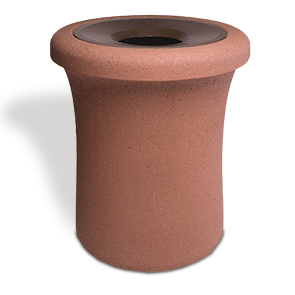 The timeless design and stable construction of this round concrete receptacle will keep any property looking good for many years to come. A popular selection of colors and finishes are available to blend to any site.